How many of you have gotten to see him play in person? I'm 23 yrs old and a first year season ticket holder of the Nuggets (I know it pathetic) but their my team. But anywho, I got to see the man live for the first time tonight. He didn't do a whole lot on the floor but it was still awsome? Anyone seen him in his prime live? I saw him play in a pre season game about 10 years ago when he was in his prime in Dayton Ohio. When he came out onto the court the fans went crazy! He was awesome to see play. 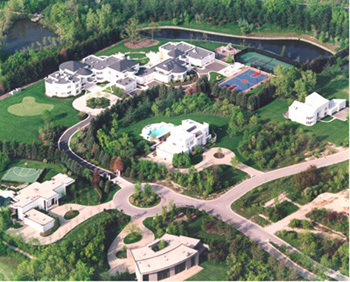 I don't think I've seen him play - however, here's a pic of his badass estate! I saw him ball all over the Golden State Warriors some years back. He is an amazing athelte and I would be surprised to ever see another like him in basketball. Yea, went to quite a few Chicago Bulls games as a kid. Great bump! The thread is 2 years old! that house is flipping crazy!!!!!! thats one sweet looking house!